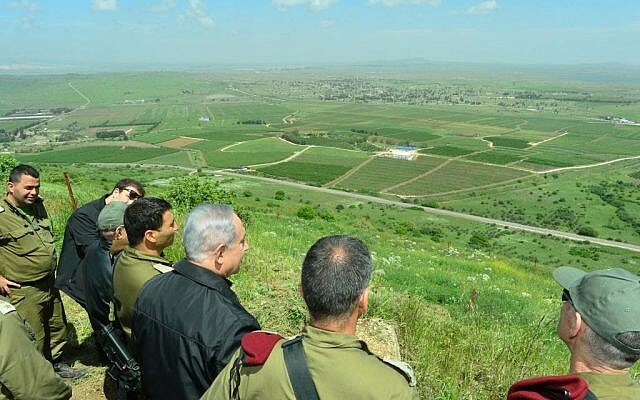 The US has for the first time published a map showing the Golan Heights as Israeli territory, three weeks after President Donald Trump recognized Israeli sovereignty over the strategic plateau. 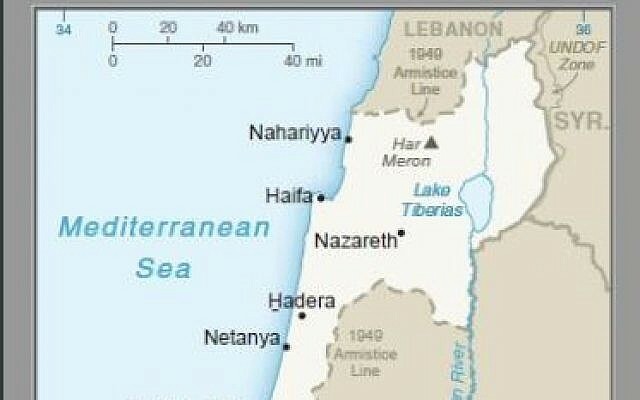 The map shows the 1974 ceasefire line between Israel and Syria as a permanent border, whereas the border with Lebanon continues to be demarcated as the 1949 armistice line. 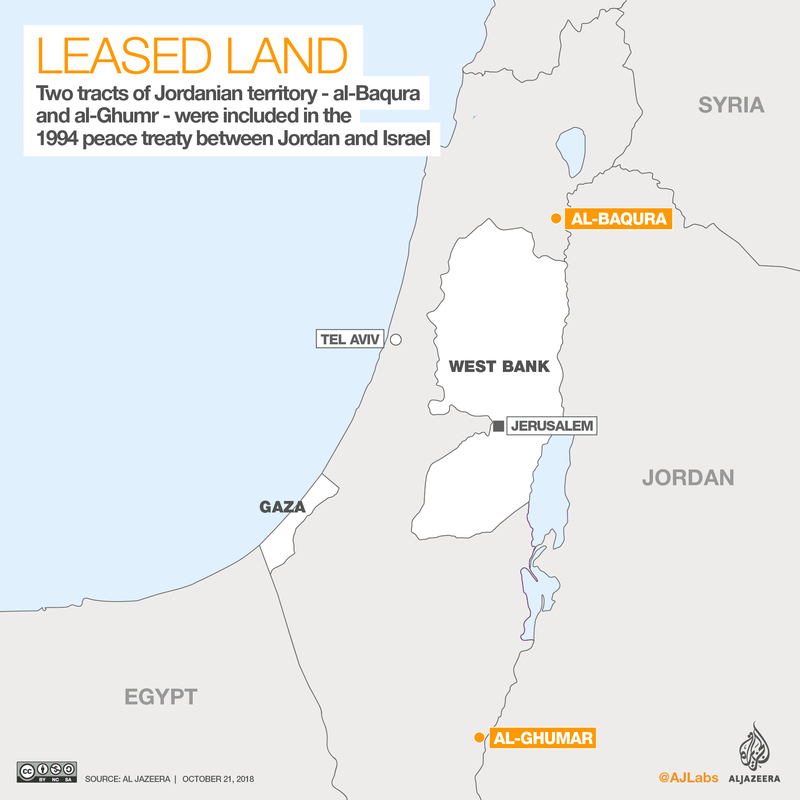 The map also notes that the West Bank is Israeli-occupied, with its final status to be determined in peace talks. And it notes that while the US recognized Jerusalem as Israel’s capital in 2017, it does not take a position on the boundaries of the holy city, which is also claimed by the Palestinians as the capital of a future state. 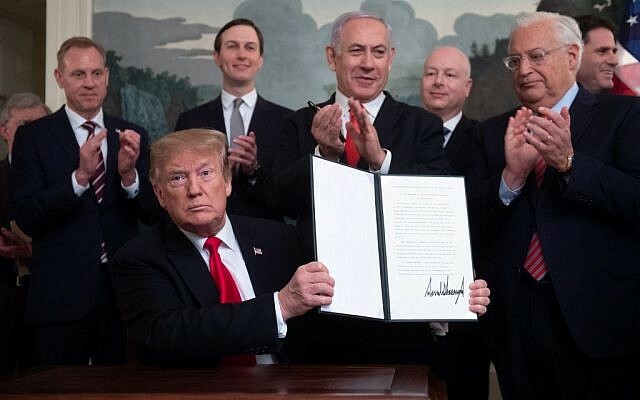 Trump’s formal recognition of Israel’s sovereignty over the Golan sparked widespread international condemnation. The announcement in late March was a major shift in American policy and gave Prime Minister Benjamin Netanyahu a needed political boost ahead of April elections. 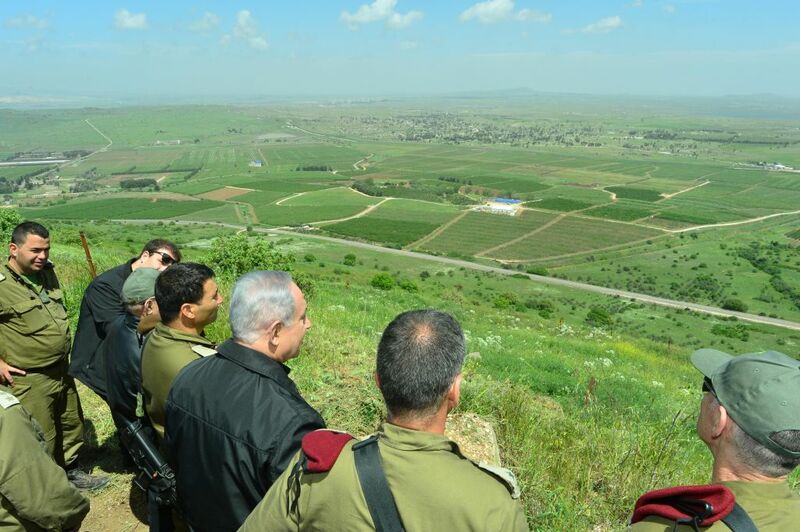 Israel captured the strategic plateau from Syria in the 1967 Six Day War and in 1981 effectively annexed the area, in a move never recognized by the rest of international community, which considers the Golan Heights to be occupied Syrian territory. 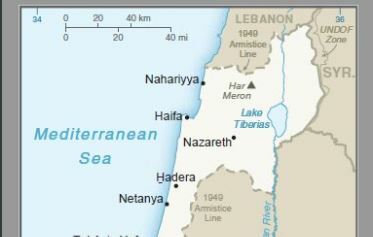 The map was published with the US indicating it may also be on board with Israel annexing West Bank settlements. 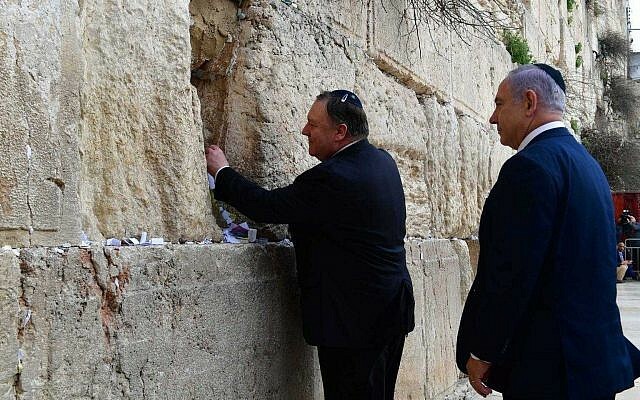 US Secretary of State Mike Pompeo on Friday said he did not believe Prime Minister Benjamin Netanyahu’s pre-election talk of extending Israeli sovereignty to all West Bank settlements would hurt the Trump administration’s long-gestating peace plan. On Tuesday, a coalition of more than a dozen conservative groups, most of them Jewish, sent a letter to Trump tacitly asking him to respect a potential Israeli annexation of West Bank settlements. The letter comes in response to a coalition of centrist and liberal groups who last week urged Trump not to recognize a potential Israeli West Bank annexation. I’m sorry, but I don’t exactly like the Title either. Here in our Country we are acting like it is back in the 20’s or something ignorant like that. We have our HollyWood and our Politics, the never-ending battle between the Dems and the GOP and we pick Our Country apart. We have several outside State Players and other well-funded hate groups who are actually in the Chess Possession to make this play. Folks, I hope they do not push the ‘ignite’ button. This would be the end of the world as we all know it all because of a couple of dozen people from around whom have some Power in this world who hate us and hate everything’ the West’ stands for. Attacking us from the inside while we bicker among ourselves is a sure Cancer to our Cells. Our current Government has weakened Us with our long-standing Allies and gotten off to a bad start with several other ‘not so friendly States.’ There is always the issue of other ‘unfriendliness’ such as Hezbollah, Hamas and many others. I pray for our Children, and Theirs. Hate, it is such a disgusting thing when we direct it at each other. Our System has many errors within it but it could be very much better. We need to address these things quickly before there is no tomorrow in which to be concerned about. Sniper attacks by Jaish-e-Mohammed militants have emerged as a new source of worry for security agencies in Kashmir with three personnel having been killed since mid-September, prompting agencies to re-calibrate their strategy to thwart such strikes, officials said. Sniper attack by Jaish-e-Mohammed terrorists has emerged as a new source of worry for security agencies in Kashmir Valley with three personnel having been killed since mid-September, prompting law enforcement agencies to re-calibrate their strategy to thwart such strikes by the Pakistan-based group, officials said. The first such attack took place at Newa in Pulwama on September 18 when a CRPF personnel was injured. Security officials thought it to be a one-off strike till the recent spate of sniper attacks that claimed the lives of a Sashastra Seema Bal jawan and an Army personnel in Tral, and a CISF jawan in Nowgam. Based on intelligence inputs, security agencies believe that at least two separate ‘buddy’ groups of the proscribed Jaish-e-Mohammed (JeM) comprising two terrorists each have entered Kashmir Valley in early September and have entrenched themselves in South Kashmir’s Pulwama district with the help of some overground supporters of the outfit. These terrorists, according to officials, have been thoroughly trained by Pakistan’s external snooping agency ISI for carrying out sniper attacks in Kashmir Valley and have been armed with M-4 carbines, used by the US-led allied forces in Afghanistan. There is a possibility that these weapons may be part of the arms and ammunition captured by the Taliban, with whom the JeM cadre were fighting the allied forces in Afghanistan, security officials in the state said. However, they said that the weapon was also being used by the special forces of Pakistan Army. In all the instances of sniper attacks, the terrorists used a nearby hillock to carry out strikes on a security force campus when unsuspecting jawans were using their mobile phones to talk to their family or friends. “These attacks have been precise, even while targeting a personnel inside a sentry post as he uses his mobile phone. They pick up the light of the mobile phone to carry out the attack on jawans,” said one of the officials. The M-4 carbine is mounted with a telescope and the terrorists are using night vision devices to locate their potential targets, the officials said. The weapon can fire at its target up to 500-600 metres with precision. The security agencies, including army, CRPF and Jammu and Kashmir police, have already issued fresh guidelines to their jawans and officers located in camps in the militancy-hit areas. Maintaining a silence over the change in tactics, the officials said that more combing operations would be carried out around the security camps. They said that Jaish cadres were likely to carry out more such attacks in the future, but added that some modules had been identified and these cases were likely to be cracked soon. The security agencies had been observing that while pushing the terrorists into Kashmir Valley from the Line of Control (LoC), ISI meticulously planned to send in Jaish-e-Mohammed cadre along. Those terrorists were armed with the best possible arsenal including bullets with steel core – with the capability to pierce a static bullet proof bunker used during counter-terrorism operations, the officials said. The first such incident was noticed on the New Year eve when JeM terrorists had carried out a suicide attack on a CRPF camp in Lethpora in South Kashmir. Five personnel of the para-military force were killed in the attack and one of them was hit by a bullet fatally despite using a static bullet-proof shield provided by the Army, officials said. A thorough inquiry into the attack showed that the bullet fired by the terrorist from the assault AK rifle was of steel core with the capability of piercing through the static bunkers used by security personnel during encounters with terrorists. Generally, the AK bullets used in the armoury have a lead core covered with mild steel which cannot penetrate a bullet proof shield but after the December 31, 2017 encounter and subsequent findings, the rules of the proxy-war changed, the officials said. A detailed analysis of the previous suicide attacks was carried out during which ballistic analysis of the terror attack on district police lines of Pulwama in South Kashmir in last August showed that ‘steel core’ bullets had been used by the terrorists in that encounter with security personnel. Eight security personnel had lost their lives in the terror strike. The ammunition, according to the officials, is being modified from across the border with the help of Chinese technology of encasing the bullet with hard steel core. At the United Nations, India has been seeking a ban the Jaish-e-Mohammed terror group and designation of its chief Maulana Masood Azhar as global terrorist, but its efforts have been blocked by China four times so far. Folks: How Do We Personally Believe In The Independence Of OUR OWN: Supreme Court? Well Folks, do We? This is a case where 1/3 of Our National Government is in the hands and minds of just 9 of Our own People. I personally would not want to have to be a judge, at any level. Not with all the sins that I know that I have committed. I don’t want to have to have a job of being a Judge where what the 9 of you say, is final. Folks, that’s just like being one step away, or below, God! I am not saying that this Job can’t be done, but to be Truly Independent of the Other 2 Branches of Our Government, at every level is necessary. To me, and I know that I could be wrong, but I believe that in Our Country’s Supreme Court Job Description, that Job Description is to make sure that all Laws are Constitutional! Now again, do the Nine Folks we now have on The Nations Top Court realize the weight upon each of them to be in charge of 1/3 of Our Government? Personally, there is no way, no amount of money that could get me to want that Job. Think of the pressure on all 9 of these folks to be, Honest. Has Our Nations Supreme Court become nothing but pawns of Big Politics, and Big Money? Do you have the Intelligence, and the Morals, do you Mr. Kavanaugh? What are you walking into Mr. Kavanaugh, do you really know? Well folks, as a very dear friend of mine used to say once in a while, “we shall see what we shall see.” Fore without an independent Supreme Court, there is no Democracy and as little as 9 people holds in their hands the weight of 1/3 of the Constitutional Government. Their sort of like those “Super Delegates” the Democrats been hosting, aren’t they? Except if you can totally control one of these 3 Branches of our Government, 9 people could control our Country. How much weight is on Mr. Kavanaugh? How much weight is on all 9 of these people? As I said earlier, I wouldn’t want this job no matter what the pay. When we add in the reality that another 1/3 of Our Government is in the hands of just One Person. Folks this means that 2/3 of Our whole Government is the Hands of 10 people. That is too much power if those positions aren’t filled with quality persons, now who decides what “Quality” is. Now Folks, does this help you see why I would not want to ever have to be in the place of one of these nine Folks. (THE ONLY THING THAT I BELIEVE HAS CHANGED IN THIS PAST 27+ MONTHS IS THAT THE U.S. NO LONGER HAS A VERY INTELLIGENT SHIITE KING FOR OUR PRESIDENT, NOW WE HAVE A TOTAL IDIOT (NOT ALIGNED WITH REALITY) KING FOR PRESIDENT.) NOTHING CONSTRUCTIVE IS EVER GOING TO BE ABLE TO BE COMPLETED IN PALESTINE SIMPLY BECAUSE THERE IS SO MUCH HATE AMID THE PEOPLE OF THAT REGION, JUST SINCE JUNE OF 2016, HOW MANY PEOPLE HAVE BEEN KILLED IN PALESTINE? Egypt’s intelligence service invited the head of Hamas Politburo, Ismail Haniyeh, to visit Cairo within the next few days to discuss various issues, mainly the stumbling Palestinian reconciliation. Several sources in Hamas confirmed that Haniyeh had received an invitation to visit the Egyptian capital along with a senior delegation from the movement. The sources said the main aim of the invitation was to resume Egypt’s efforts to complete the reconciliation between Fatah and Hamas. Egypt decided to intensify its contacts with all parties in order to remove obstacles to the implementation of the agreement it sponsored on October 12 last year. 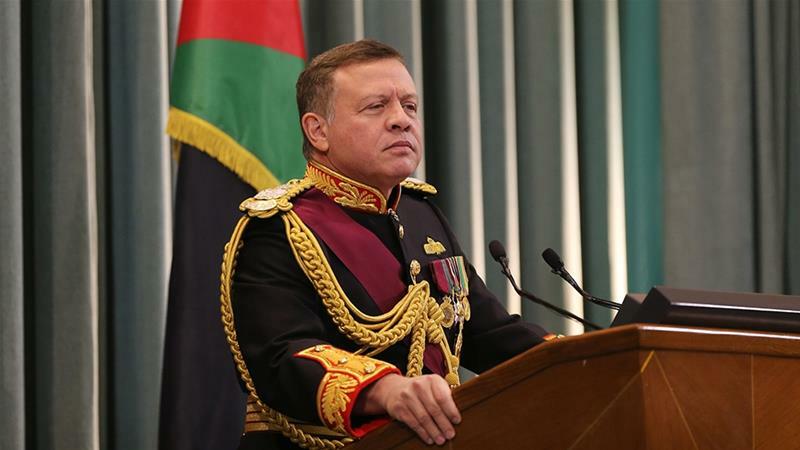 Egyptian efforts came after the appointment of a new Egyptian intelligence chief. Before Hamas received an invitation to visit Cairo, Fatah Central Committee member Azzam al-Ahmad held talks with Egyptian officials in this regard. Al-Ahmad said that Egypt has started moving towards completing the reconciliation file. Sources told Asharq Al-Awsat that Egypt wanted to reach a specific agreement with Hamas on controversial issues with Fatah, such as security empowerment, as well as the possibility of forming a unity government to prepare for the general elections. Egypt has also asked Hamas to maintain peaceful “return marches” so as not to cause a deterioration of the situation that could lead to a new war. Abbas had announced his intention to take national and financial measures against the Gaza Strip after the assassination attempt on the Palestinian prime minister in Gaza last March. The assassination attempt froze all contacts on reconciliation that had already been stalled between the two movements.